Large, long-legged and lumpy, moose wander woods and waterways gobbling grasses and other plants to nourish their big bodies. 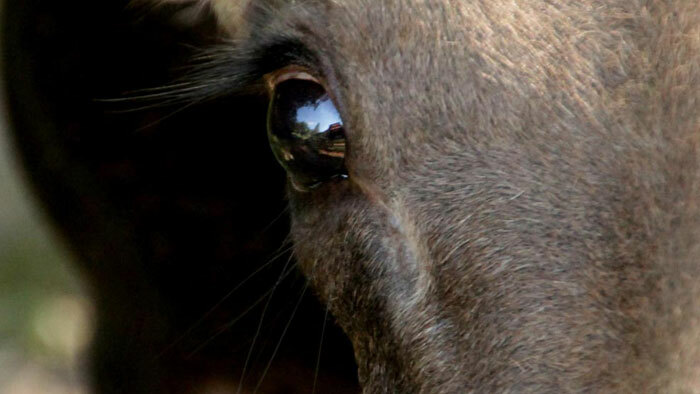 Unlike other deer that travel in herds, these animals most often live alone or in small family groups. Moose prefer new shoots and leaves of shrubs and trees as well as water plants. They will eat bark and twigs when other food is scarce. Forests, swamps, bogs, and other wetlands provide good food and shelter for moose. 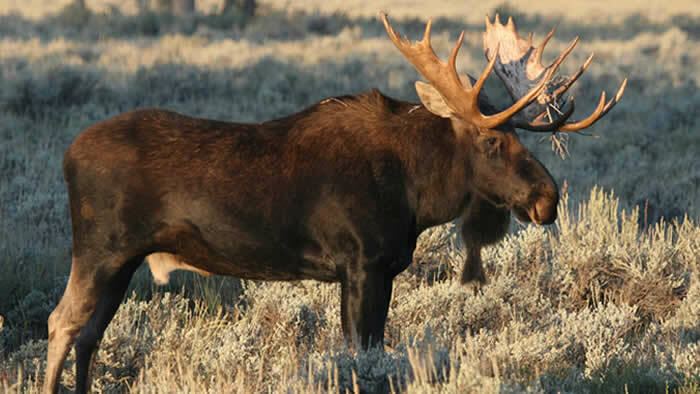 Moose are most active at dawn and dusk. The males’ big antlers help them compete for females and fight off predators such as wolves. A thick coat and long legs help moose survive the cold, snowy winters of the North Woods. Moose are generally doing fine across their range. Populations are declining in Minnesota for reasons that are not completely clear but may be connected with global climate change. 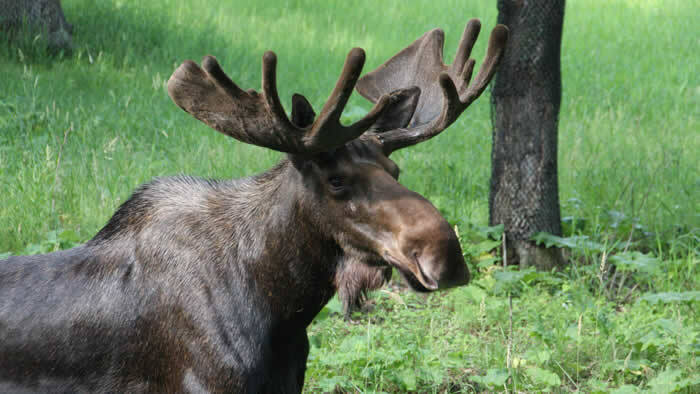 The long flap of skin hanging under a moose’s chin is called a dewlap or bell. The moose’s huge, spreading feet help keep it from sinking in as it walks on muck or snow. Moose have no top front teeth. They grab their food with their upper lip. A set of moose antlers can weigh up to 85 pounds and measure more than 5 feet from tip to tip. Native people across the northern lands have many traditional uses for moose. Moose meat can be a main source of food: one moose can provide 500 pounds of meat. The heavy hide makes good clothing, moccasins, and snowshoes. The black sinew can be used as sewing thread. Moose antlers and bones can become tools, and their hooves may become rattles for religious ceremonies. Moose bellow during mating season. They also have an alarm call, a distress call, and a vocalization that helps reunite a calf with its mother. When feeding in a river or lake, moose will submerge their head under water but leave their ears out, listening for sounds. In Minnesota, the moose population declined by more than 50% between 2006 and 2015. If this trend continues, few moose will be left in the state by the end of the decade. There are many possible reasons for this decline. Scientists are studying how warming temperatures, parasites, predation, and other factors may be influencing Minnesota’s moose populations. Minnesota Zoo biologists are working with the University of Minnesota-Duluth, Voyageurs National Park, Grand Portage Indian Reservation, the Minnesota Department of Natural Resources, and others in northern Minnesota to address moose habitat needs and understand mortality. They are examining moose habitat during warm temperatures, parasite transmission from deer to moose, wolf-moose interactions, and causes of moose calf mortality. Learn more.